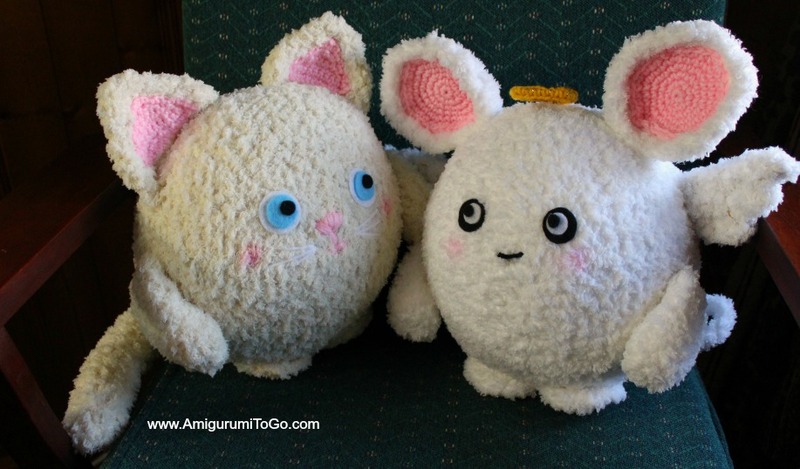 If you missed it, I just posted a pattern called, Mary Mouse. It is just like this kitty. While testing the mouse's pattern I decided to make this cat instead of another mouse. When it was all done my youngest son came to see the new character. I asked him what should we name her? He quickly replied "Olive!" Then he said "Olive You!" Which sounds like I love you when you say it quick. Sweet right? 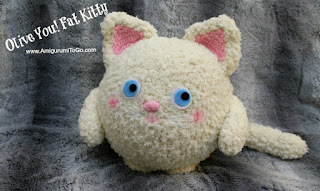 To that name I added, Fat Kitty. So let me introduce to you "Olive You! Fat Kitty"
These are pillow type amigurumis. About 13 inches tall to top of ears and a very squeezable 28 inches around the middle. There's no hard parts (aside from Mary's halo) making them perfect for hugging! PLEASE NOTE: This isn't a pattern for a beginner because it uses fluffy yarn which makes the stitches hard to see. It also requires some experience when sewing it all together. 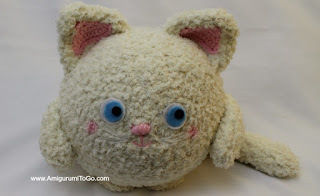 If you're just starting out in amigurumi making, I'd hate for you to get frustrated and this pattern might frustrate you. *To see the individual parts and what they are supposed to look like when you are done, look in the assembly section below. NOTE: you can use the single crochet for the tail instead of the hdc. I just wanted it to go a little faster so used hdc. If you prefer to use the sc, you'll need to add more rows between 3-.19 The number of rows is up to you. Make the tail as short or as long as you want. Stuff the tail lightly as the tail gets longer. It'll be easier than stuffing it after it's all done. *Use bobby pins if you have them, they work the best on this project. Pin everything in place before sewing. Please pin first! Because the body is so round it will take some time and adjusting of the parts to get them to look right. I had to remove one ear as I sewed it on a bit too far back. I did the same mistake on the mouse pattern too. Removing parts from a piece made with fluffy yarn is very difficult once sewn on, so take your time in pinning then viewing from different angles before sewing. You will be happier with the end product. 2) sew the ears on. They are in line with the arms. 3) sew the legs on. I sewed them very close to the front of the doll and left the very front of the legs free of stitches, sewing only the back part to the body. Again, pin these on first! Then stand the doll up and see how it looks before sewing. 4) sew the tail on. 5) Do the face. I left the face for last. It's much easier to center the face once all the other parts have been sewn on. You can do whatever you want with the face. I kept mine simple but the finishing touches are totally up to you. I cut 2 larger pieces of white felt, 2 medium pieces of blue felt and 2 small pieces of black felt to make up the eyes. These are all hot glued together then hot glued to the doll. Play around with the eye placements before gluing. Once hot glue touches yarn it will not come off so do this part very carefully and use very little glue. The nose and mouth are whip stitched on with pink yarn. Using a q-tip I rubbed in some blush to the cheeks. Awwwww, I can't wait to make this. Thank you! not for these ones, sorry. You can't see the stitches so it would be hard to show anything really.